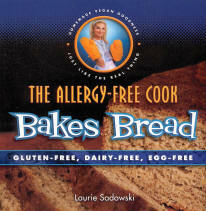 When we first heard the title, The Allergy-Free Cook Bakes Bread, we became intrigued. When we received our review copy, we became impressed and delighted with Laurie Sadowski's wonderfully innovative bread, rolls, and cake recipes. There was even a recipe for making pita pocket bread and pizza dough/crust. In addition to the recipes, Laurie has sections that describe all the ingredients she uses, such as sorghum, tapioca, and teff flours, and where they can be purchased. She talks about veganism, the things to avoid in prepared foods, and there is even an English/metric conversion table. We highly recommend The Allergy-Free Cook Bakes Bread for anyone with any form of food allergy or irritable bowel symptoms. It is also an excellent reference book to have on hand when you are preparing food for someone with allergies, or just to enjoy these delicious recipes.